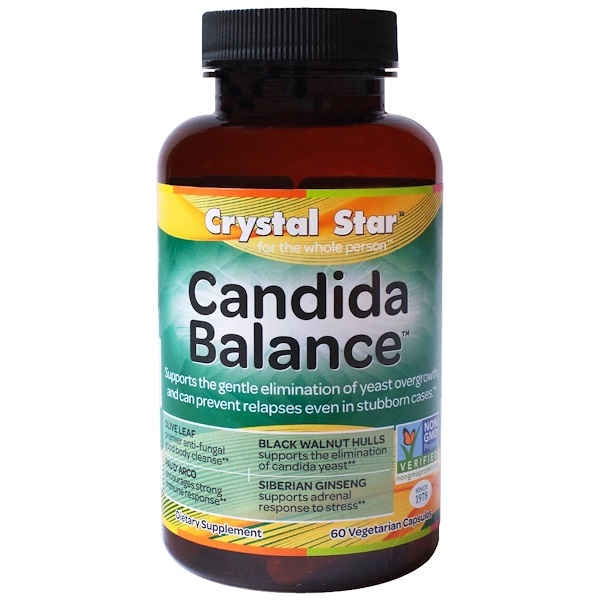 Supports the gentle elimination of yeast overgrowth and can prevent relapses even in stubborn cases. For over 35 years, it has been my goal to help you feel better safely & naturally. Formulated by myself. Crystal Star products are the best choice. Linda Page, Ph.D. Traditional Naturopath. Take 2 capsules twice daily for 3 months. Rest 1 month before resuming, if needed. Vegetarian capsules (vegetable cellulose and water) organic brown rice, magnesium stearate. 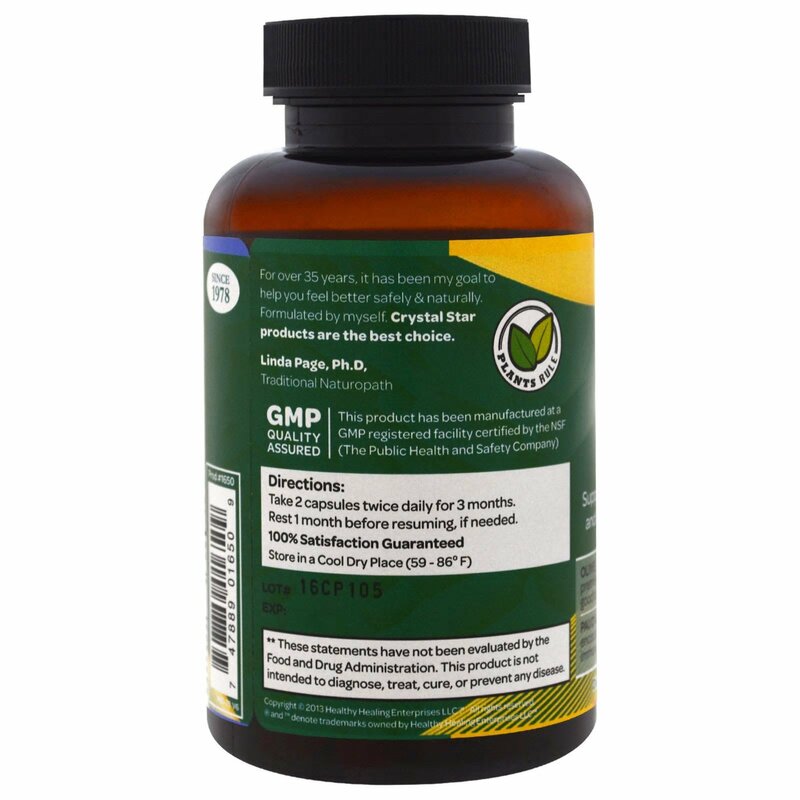 GMP Quality Assured - This product has been manufactured at a GMP registered facility certified by the NSF (The Public Health and Safety Company). Note: Do not use if the tamper proof seal is damaged or missing. Do not use under the age of 18. Do not use if pregnant or nursing. Consult a healthcare professional prior to consumption if you have any pre-existing medical conditions or are taking any prescription medications. This product contains Cascara Sagrada Bark. Do not use if you have or develop diarrhea, loose stools, or abdominal pain because Cascara Sagrada Bark may worsen these conditions and be harmful to your health. 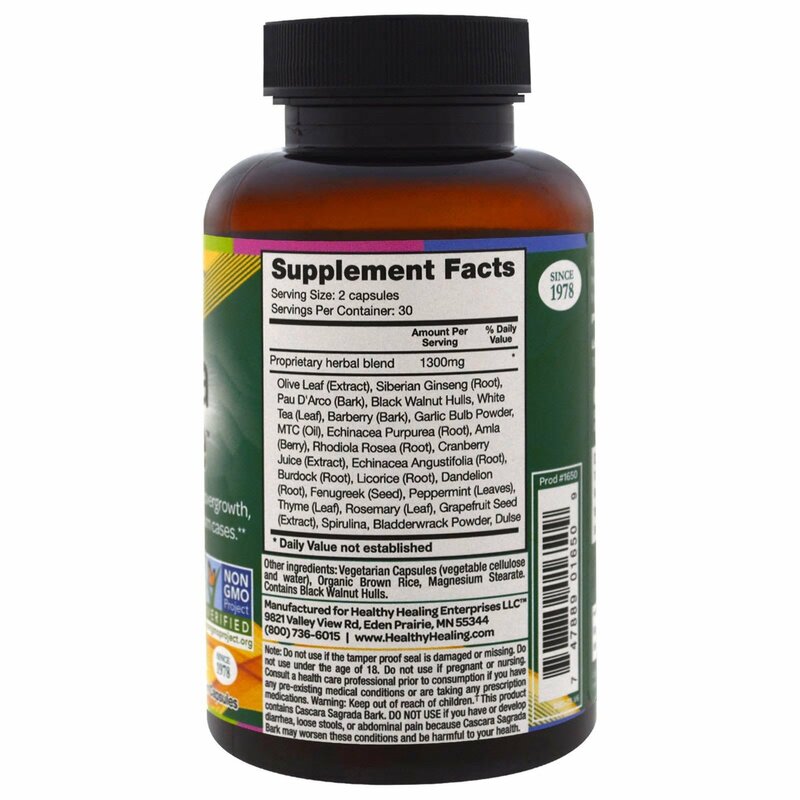 Olive Leaf (Extract), Siberian Ginseng (Root), Pau D'Arco (Bark), Black Walnut Hulls, White Tea (Leaf) , Barberry (Bark), Garlic Bulb Powder, MTC (Oil), Echinacea Purpurea (Root), Amla (Berry), Rhodiola Rosea (Root), Cranberry Juice (Extract), Echinacea Angustifolia (Root), Burdock (Root), Licorice (Root), Dandelion (Root), Fenugreek (Seed), Peppermint (Leaves), Thyme (Leaf), Rosemary (Leaf), Grapefruit Seed (Extract), Spirulina, Bladderwrack Powder, Dulse.